What I intended to be a week or so break from blogging and manually playing Mafia Wars turned into to about 4 months. The fact of the matter is I was overwhelmed trying to keep up with Zynga. Like many have always said 'Event Fatigue' was going to cause the end of the game and it kept getting worse. Blogging became work instead of something fun to do. With the development of sophisticated and easy to use automated scripts, blog posts about what you needed to do in the game became obsolete. My blog quickly turned into pictures of banners and daily links and it was boring. Many who didn't want to visit the blog to get their daily links threw a fit that I had stopped posting them on the fan page. To me this was more evidence that an outside blog wasn't needed and the fun which included community involvement had disappeared. I tried to put my exit into words but I didn't want to highlight negativity for those who still played and enjoyed the game. Now we find the game going in the opposite direction. Rumors are flying as the clues pile up. There hasn't been any new content for a while. Those who have completed their Limited Time Property update will find only 3 banners and I don't recall ever seeing this. It doesn't look like the monthly updates of loot are going to happen but that really isn't a big deal since none of that loot has helped anybody for a long time. The rules of the VIP Membership Program never guaranteed a monthly update but they do promise new weekly loot. A loot update did happen the other day but it's only the 2 weekly items for VIP subscribers. What's more interesting is that there are only 2. Normally they do a month at a time. 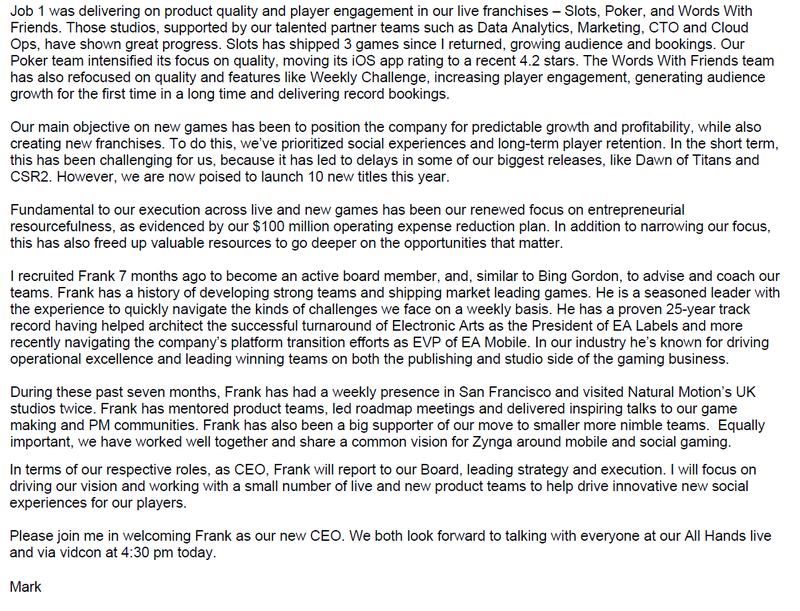 The following emails from Mark Pincus and the newly appointed CEO shed some light on what's happening with Mafia Wars. The timing matches up perfectly to what we have seen in game. Click images to enlarge. This is the memo from the new CEO. The conspicuous absence of any mention of Mafia Wars worries me. Since pretty much everything behind the game's difficulties is a direct result of Zynga's ineptitude, if they're not going to have the decency to keep the game going then they should at least have the decency to sell the rights to the game to people who aren't idiots. 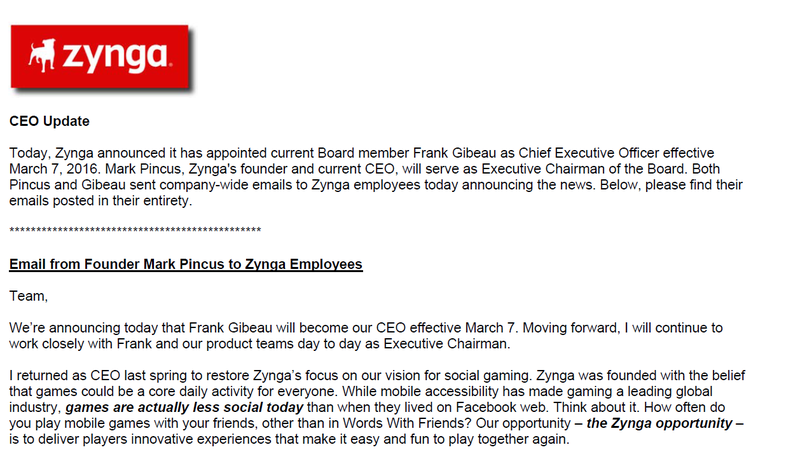 It seams zinga is moving away from Facebook. If long term players is one of their goals, going android/ios may be the future of mafia wars. Though the tools we use will be gone as the tools has not been developed, or supported in this area, which may lead to the loss of more players. Hopefully instead of closing down, Mafia Wars' gameplay will be transformed into better form by the new CEO in order to make it more fun and appealing to today's gamers (including all of us). We ARE talking about Zynga, right...? With the changes that FB implemented and the ongoing game degradation that Zynga kept pushing as updates, turned it into a chore, Mafia Wars became less and less of a social experience. The need to check blogs and other sites were for the scripts and work arounds to the latest road blocks. 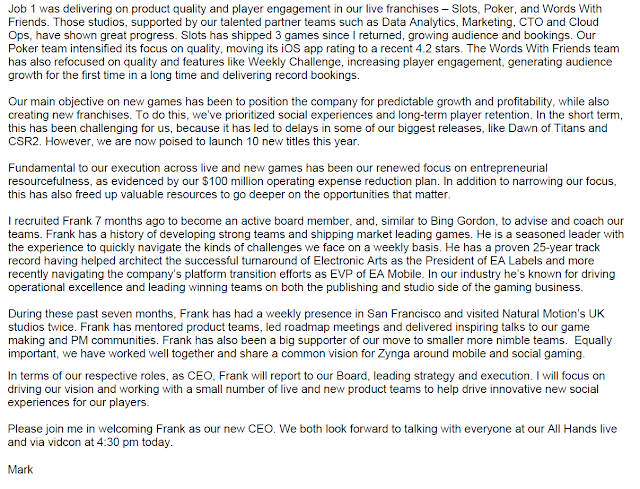 Zynga raked in lots of cash from Mafia Wars players over the years but I doubt they will send anything more than a form email when they announce the inevitable closing. Like every product that any company creates it goes through a 4 stage life cycle. Once the product matures it is a cash cow bringing in lots of money for little expense. When the product declines it is at the last stage and retires or a product extension occurs to keep the cash cow going. Mafia Wars has been a cash cow for awhile now with no real effort or cost. It has been declining but Zynga extended the product by VIP subscription. Mafia Wars keeps declining and now it is time to retire the product. all I read from it is they will be focusing on mobile gaming and a few FB games that dont include Mafia Wars. Just put the game out to pasture and let us know. Frankly, I wouldn't be bothered if Zynga closed Mafia Wars now. It takes up too much of my time, and it would be a good excuse to drop it. If I hadn't got a load of facebook-mafia-wars friends, I'd have probably stopped already. I'm not sure what else they could do to revitalise the game. After all, all the events were attempts to keep people interested and playing, and half of them backfired because it was just too much. I'm working hard to finish Japan right now, in case MW closes. If it carries on, but just on tickover as it is now, I'm not sure I'm going to be very motivated, as I can't compete with people who are tens of thousands of levels above me. One really good side of no longer playing, would be I could unfriend the people whose only other posts on facebook I find offensive, racist and misogynistic stuff. Well If MW goes then I can save $24.95 a month and say good by to FB :) yay !! Nice to see you back Jen and thank you for the info. I still come to your page every day and you are greatly missed! We have learned to rely on you for news and with you gone we were lost. Welcome back, even if it just for a short time. Mafia Wars is a social game and essentially has minimal graphics. If Zynga is all about moving towards mobile it would not be difficult to create a mobile app us to play! I sure hope the figure it out. I just got the message playing the game that they're closing it June 6th. In a friggin' pop up window. Imust say... this blog has been alive for many years... and the tom you chose to "quit" blogging... was funnily enough the SAME time Zynga chose to slow down on events till it came to a complete stop. Things weren't happening at all and that was unusual. I simply did a internet search and found these emails so posted them. The writing was on the wall for a while. I stopped blogging because it became too boring. What was I gonna do keep posting about Arena Smashup 200 or whatever thing was copy/pasted over and over. Not what I wanted to do. I found something interesting and posted about it. I can't help that it was the day before the game shut down. I supposed someone will end up blaming me for it closing too. And even if what you say is true who cares. If I did have inside info I obviously couldn't post about it so what would it matter? I don't blame you for the closing of MW... I blame the greedy, good-for-nothing monkeys at Zynga... if they had cared just an ounce about the game and the players, MW would not have been closing down. But, Zynga isn't into making games for the passion of making games... ´nor are they into making games for their loyal gamers. Zynga is ONLy making games for the sole purpose of squeezing every last cent out of a game and the second the game doesn't make enough money...they close it and move on to the next game... this has been their MO for many years. But IF they had made games for the LOVE of their games and for the true passion... things would have been different. Just wanted to say that in response to the "blaming" part. Jen, Thank you for your years of help and knowledge. If Z had listened to you, it would have made more cash from MW and keeping it going even now. I miss my daily visits to your blog. I agree though, the sun had set on Mafia Wars and the need for this blog. I can't thank you enough for running this blog over the years. Loot Lady Come to Gta v ps4 itz where it's at Now😃 |)*()*|) Founder 2009 and continues on Gta.